Time to take a break from breasts- though I think I may have one more post in me on that subject. I’m a fan of a paleo diet. There, I said it. To me it is not “the” paleo diet, and there is no single set of “rules”, but I embrace the idea of thinking about our evolutionary past when talking about health and disease. Like it or not, what we eat (and of equal importance, what we don’t eat) is one of the major forces that shape our health. Let’s face it, it’s much easier to change what you eat than to change your genetics (and probably your job, your geographical location, and other things that affect health). There’s been increased coverage of a paleo diet in the media of late- usually not a resounding endorsement, not that I’m surprised- and it’s sometimes referred to by other names such as “the caveman diet” (except our ancestors largely didn’t live in caves) or the hunter-gatherer diet. I generally like (and use) the term ‘paleo’. For me (and many others), it’s a term that has developed a definition that we all understand. That being said, I also like the idea of talking about a ‘hunter-gatherer diet’. It gives a nod to seasonality, encourages us to think about naturally available quantities, and a personal involvement in the food we eat. Sure, a lot of people who “eat paleo” don’t hunt or gather their own food (though certainly some do), but it’s good to be mindful of when you might actually have access to different foods and in what amounts. I’ve never been a hunter (though I love having friends that are, and appreciate the stock of venison I have in my chest freezer), but I’ve been gathering since I was little. I’ve been involved in two different types of “gathering”- spending a portion of my summer childhood raiding (or being put to work) picking in my family’s garden and also time in the woods scouting for wild edibles. It’s funny how times change: these days I love getting out in the sun to pick berries at a local pick-your-own place, but as a child I really thought of it as a chore (I’m guessing it’s mainly because when the plants are yours you don’t want to let anything go to waste so you pick whether you want to or not, and you also pick *everything* instead of just as much as you want). 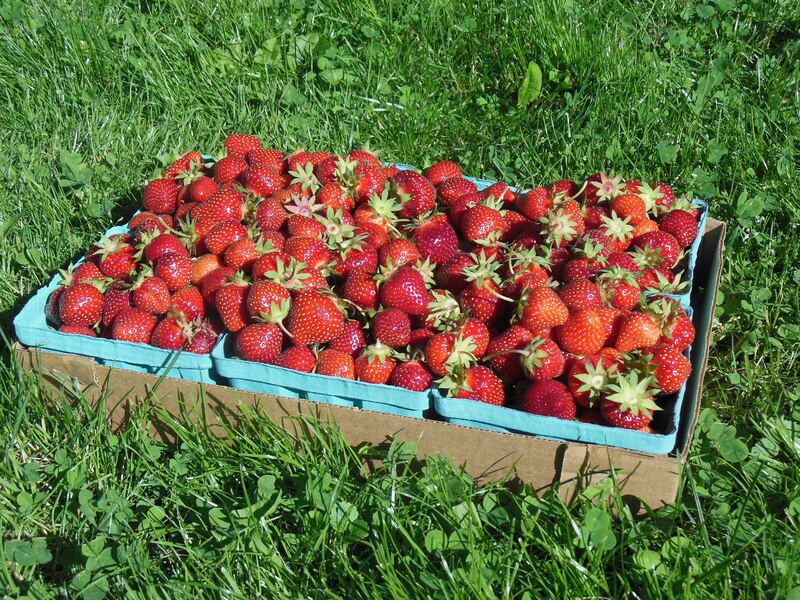 Of course, picking quarts of strawberries at the local pick-your-own place is NOT gathering (in the truly ancestral sense of the word), but it’s fun (at least for me), and while I’m picking vitamin C I’m getting vitamin D for free. I’m also supporting local farming families, keeping money in the local community, and keeping an eye on how the food I eat is grown. The farm I go to grows a variety of strawberries, I exclusively pick the “Early Glow” variety. They are, without a doubt, the best in the field, though arguable more tedious to pick since they are quite a bit smaller than most commercial varieties. They are well worth any extra effort, as the flavor is unparalleled (though their shelf life is very limited). As a child, while I was duty bound to pick strawberries, raspberries, blueberries, blackberries, and whatever else we had in the garden, I still would go out “exploring” with friends and bring home wild bounty. To this day wineberries are one of my favorite fruits. Seedy, waxy, and plentiful (if you happen to beat the birds to the punch), I would spend hours with my friends gathering these treats. 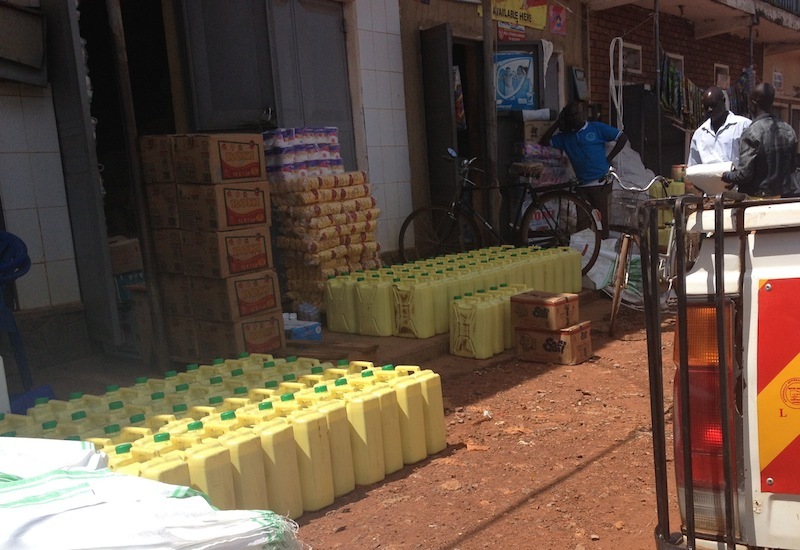 I still find it difficult to pass a stand without stopping for a snack. Stopped for a snack- I’m being a bad Pony Clubber, allowing my horse to grab a quick bite with the bit in her mouth, but it seemed unfair to stop for a snack for me and not let her grab a mouthful as well! Wineberries are just ripening in my area, but I haven’t had a chance to get out and pick any yet. 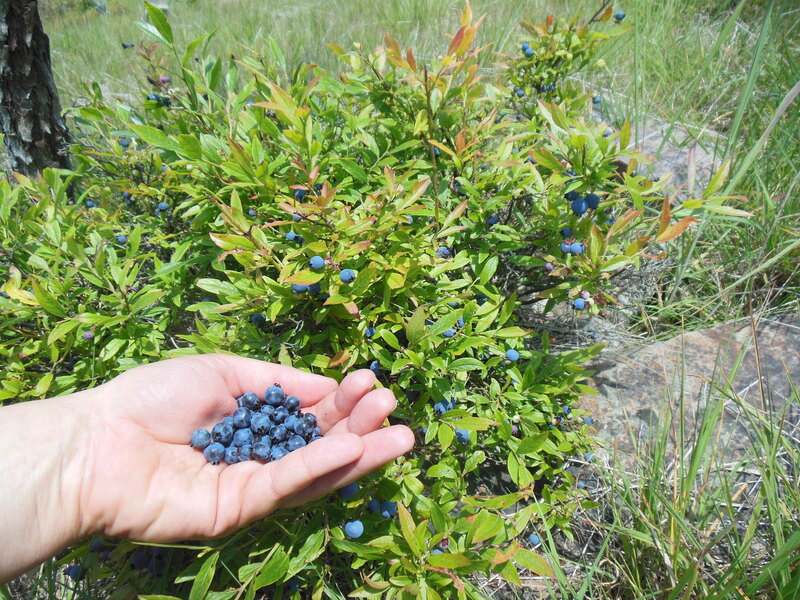 However a couple weekends ago I was out hiking on the Appalachian Trail (AT) and came across blueberries- LOTS of blueberries. 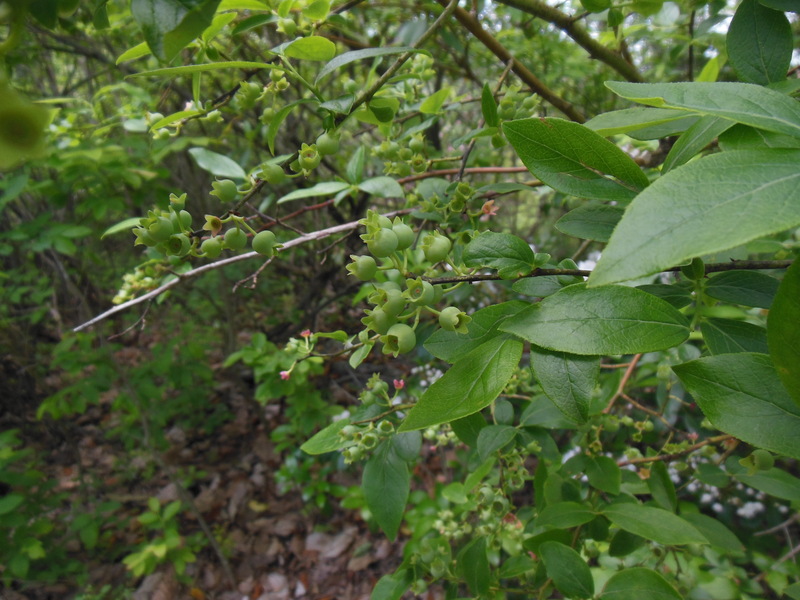 I’d seen the green berries at other places earlier in the season, and fortuitously happened to be out on the Blue Mountain portion of the AT when the berries in the area were ripening. These had caught my eye on the trail a week or so before I hit the motherload! 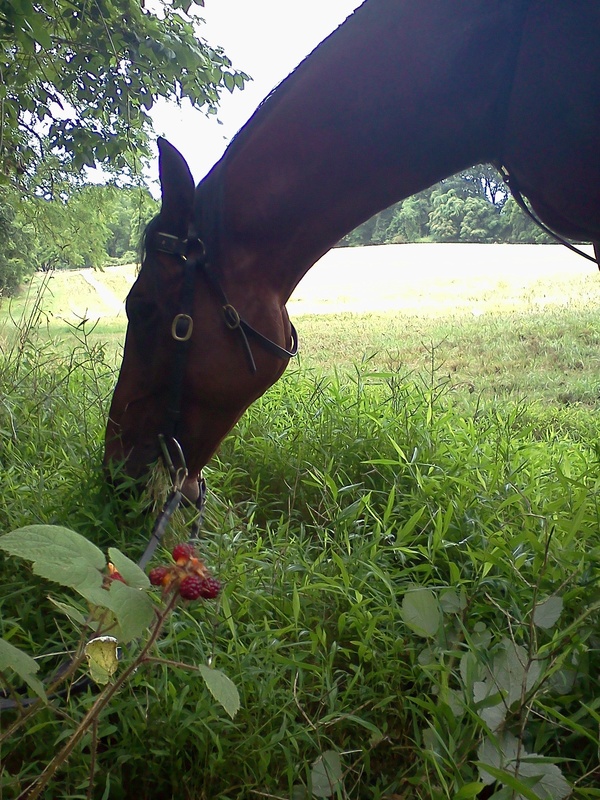 I felt a little bad for my hiking partner, since I seem pathologically incapable of walking past a good stand of berries without stopping to pick. When I was up in Maine a few weeks ago I went beach combing with a friend. 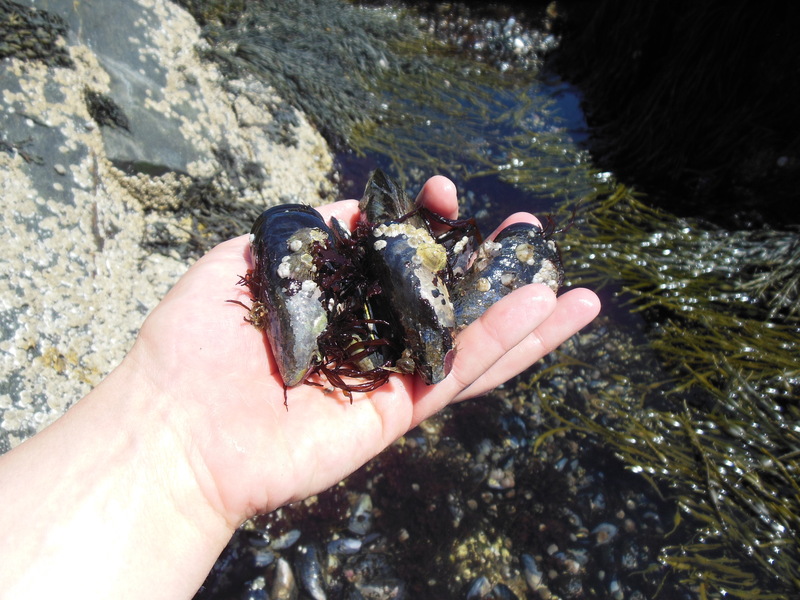 To our excitement, while we were out at low tide we came across a few pools that housed beautiful large mussels. We were looking forward to cooking them up in some white wine until we discovered there was a red-tide warning for the area- what a shame! 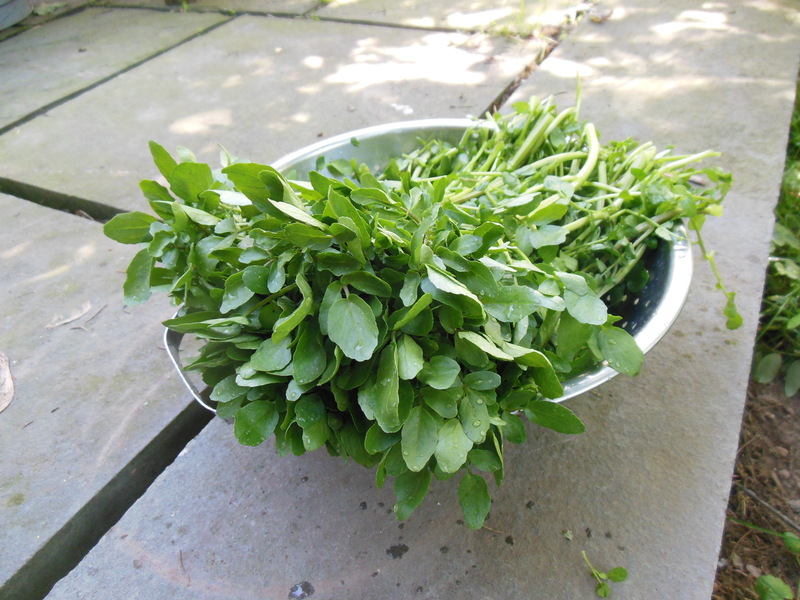 Most recently I’ve been gathering watercress from a local stream. I know the thought of this makes my European friends cringe, but the liver flukes that make this practice a hazard in other countries don’t live in the US- or so I’ve been told. 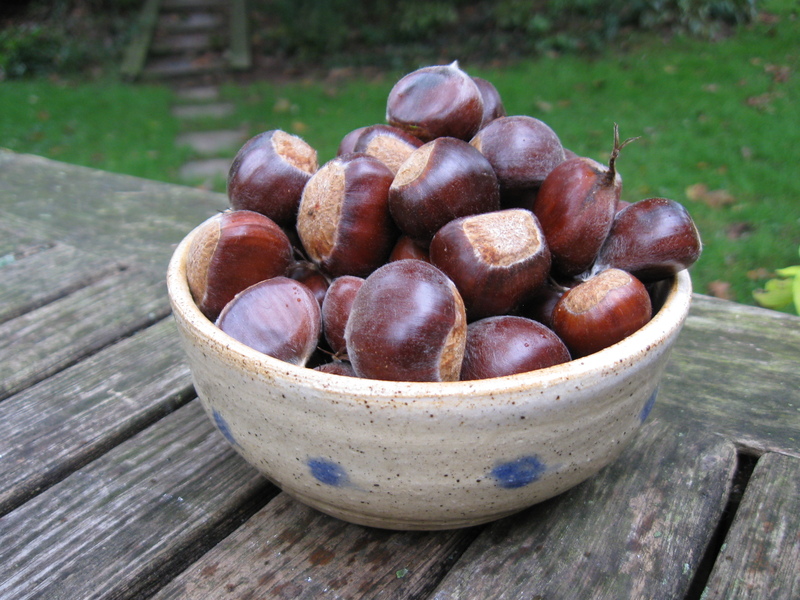 In the fall I’ll be gathering chestnuts, a task I’ve been doing for years. My neighborhood has quite a few old Chinese Chestnut trees- I wonder if there was a local craze to plant them some decades back. Best roasted, though I have been known to make a dark chocolate/chestnut mousse at times- don’t tell the paleo police! A “paleo” diet isn’t about prehistoric reenactment. The point isn’t to only eat foods you’ve hunted or gathered, but personally I like having a role in sourcing the food that I eat, and I do enjoy time spent outside gathering foods. The food “gathered” at a pick your own berry farm certainly isn’t the same as the food our ancestors gathered (I’ll refer you back to the post I did on bananas– check out the difference between the wild and the domesticated fruit), but what you pick yourself will be infinitely fresher than what you buy at the supermarket. As I was finishing up this post, I heard an interview on NPR with the author of a new book, entitled Eating on the Wild Side. Her premise seems to be that the plants we evolved eating were very different from their domesticated ancestors that we eat today, and that somewhere in the mix foods have lost some of their most valuable micronutrients *. I can’t speak on the book, but the interview is certainly worth a listen! *Interestingly, some people have suggested that some of the nutrients that the author above touts can actually be problematic. 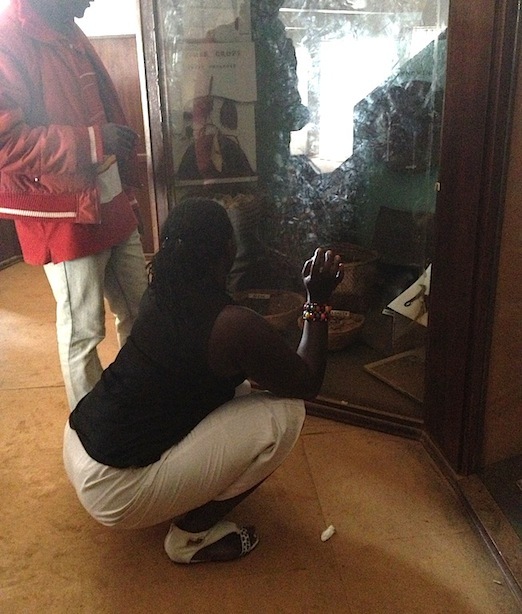 You can check out Dr. Ede’s talk from the 2012 Ancestral Health Symposium exploring the darker side of plant foods. As I’ve written before, I’m a fan of eating odd bits. If you’re going to eat meat, and you want to be ethical about it, I think you should make the effort to try and eat all the parts of an animal (or use them in some manner). My family raises cows, so I’m well aware of the importance of “hanging weight”- the weight of an animal’s carcass after it has been killed and eviscerated. If you buy an animal by the whole, half, or any other fraction, it’s likely that the cost is calculated based off of this number. This weight, however, does not include lots of other tasty (and incredibly nutritious) bits that an animal has to offer. When I buy an animal from a farmer for butchering (or when I send my own animals to slaughter) I make sure I put in a request for lots of odd bits: I want the animal to be fully utilized, I want to get all the tasty bits, I want to get all the nutritious parts, and heck- I want to get my moneys worth! As a result, I sometimes end with a substantial stash of offal in my freezer (especially beef offal, as not everyone who buys beef from us wants the odd bits, though that is changing as we sell more meat to paleo and foodie eaters). When I came home to my parents this weekend, I thought I’d have a go at eating some of odd bits… My photography is definitely not up to par with many food blogs, but hopefully I do these tasty bits justice (though it takes a better artist/photographer than me to make a raw beef tongue look anything other than kinda weird). 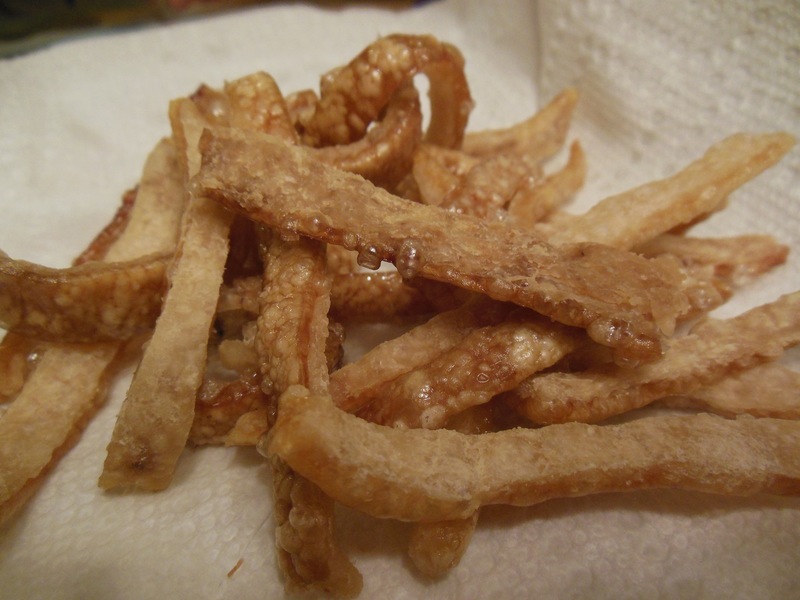 It all started on Friday night, when I decided it was time to experiment with some of the pork skin that I requested from the Berkshire pig I purchased this fall from a local farmer. I found this page and gave their method a try. The result was tasty, though perhaps a danger to my teeth! This set in motion a bit of a personal challenge to see how much offal I could put to good use this weekend. 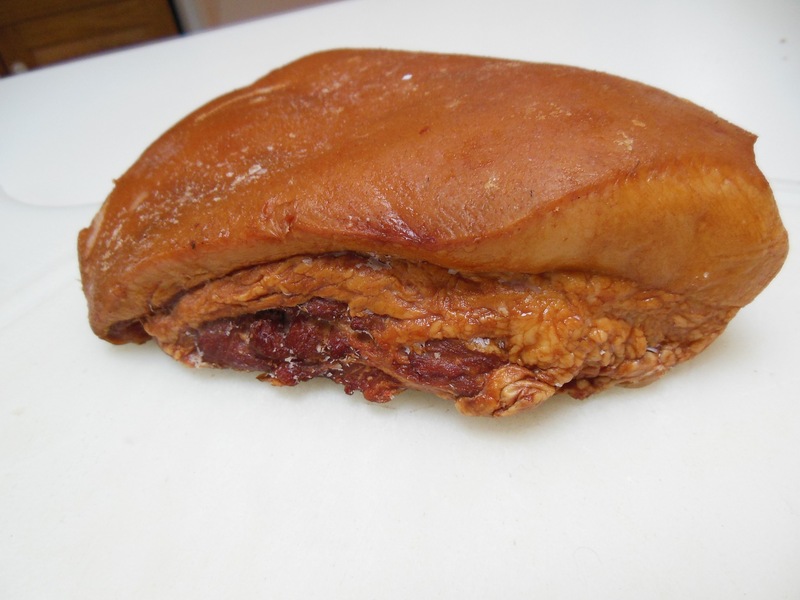 Next on the block was a beautiful smoked jowl from the same Berkshire pig as above. 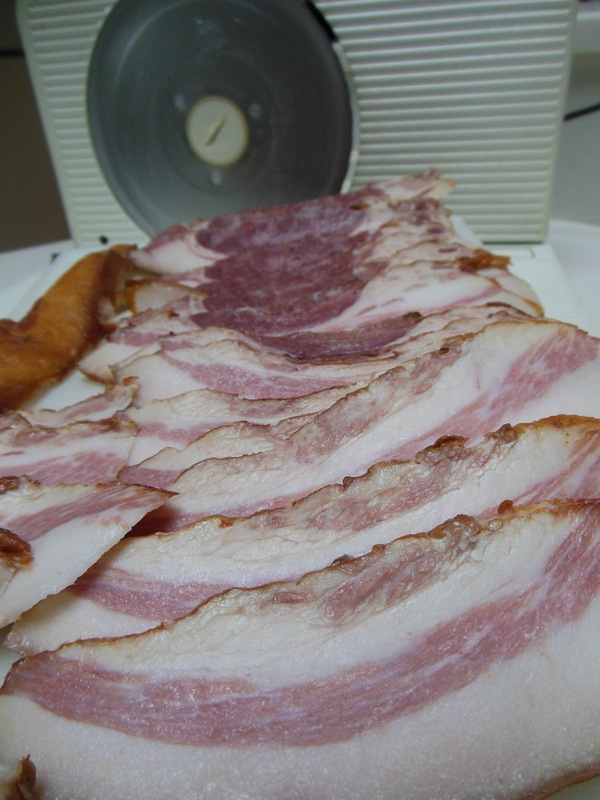 Jowl is a really fatty piece of the animal that makes BEAUTIFUL (albeit very fatty) bacon. It can also be cured in other styles such as the Italian Guanciale (which reminds me, I have a piece of jowl from another pig in my freezer that a friend cured into Guanciale at home (<– Worth checking out, if only for the pic of a curing pork jowl hanging from the ceiling). If you don’t request that the butcher save the jowl, I expect it ends up being ground into sausage- a shame for such a delicacy to end in anonymity. I initially tried to slice this by hand, but quickly realized this was a job for my little deli-slicer. As its winter, I’ve been using quite a bit of stock out of my freezer for soups and stews. It seemed like this weekend was a good time replenish my stores by making some collagen rich pork stock from pork trotters and neck bones. 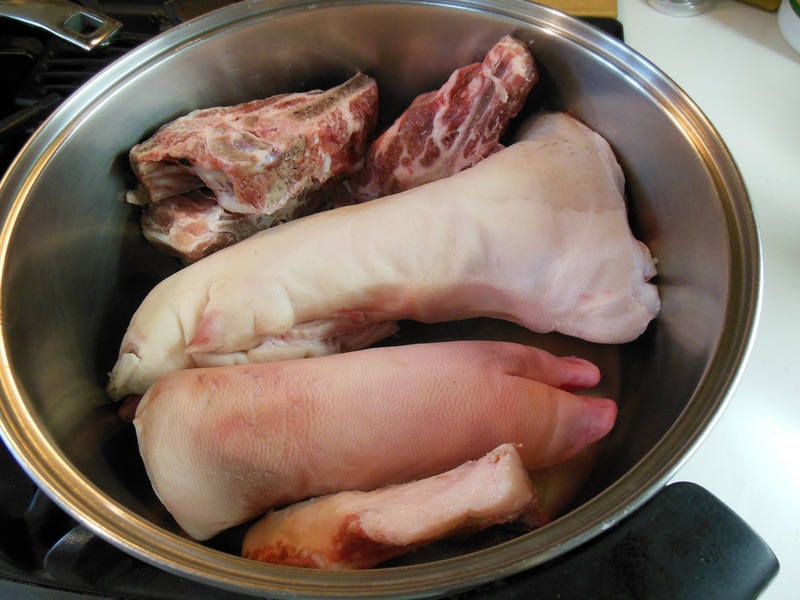 Trotters and neck bone, to be made into stock. I shared this pic on my personal facebook page and the general consensus there was “gross”. Although trotters don’t have the same panache as a standing rib roast, they do have a certain je ne sais quoi (and I wouldn’t call them gross). A number of years ago my parents were visiting Paris. At a restaurant, they were offered a menu in French and English. My father’s grammar school French led him to believe that an item on the menu was “foot of pork”, but the English menu said “leg of pork”. When he inquired, the waiter assured him that it was leg of pork (I think you see where this if going…). When a trotter was brought to the table, my father was less than amused. It is worth noting that my parents are from England, bringing up theories of potential remnants of French-anglo animosity! As I write this, the trotters have been simmering for almost 24hrs and have made three lovely batches of stock. I have some omnivorous scrap-disposal units that are looking forward to the remnants! I used some of the stock to make a hearty soup for lunch today, which I paired with a luxurious beef marrowbone. 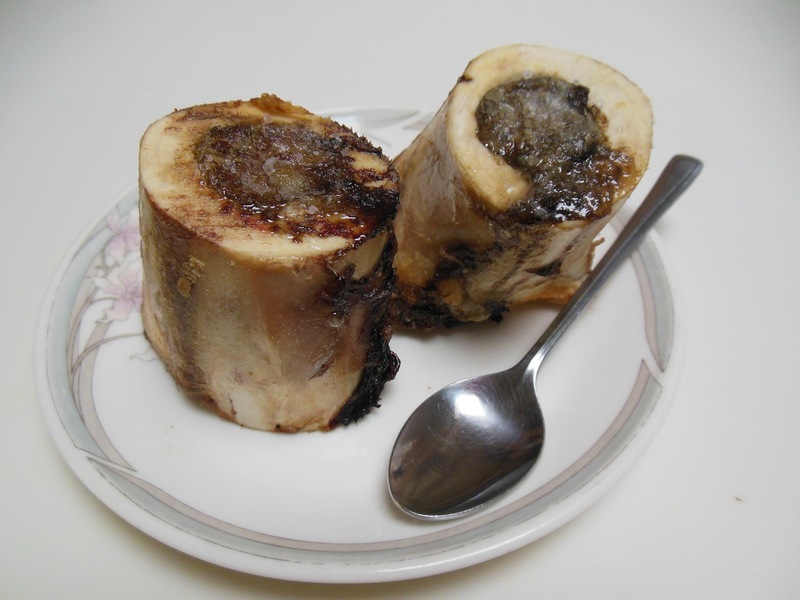 Marrowbone- I describe it to skeptics as being similar to a savory crème brulee. I’m one of the few med students on my current rotation who consistently brings lunch. In preparation for this week, and in keeping with the offal theme, I decided to cook up a cow tongue. After it has simmered for a number of hours I’ll shred it and sauté it with an onion and some spices, eventually portioning it out with some mashed sweet potato. The final offal of the day is a meaty shinbone that I will stew up with a beef kidney, making the old British standby Steak and Kidney (minus the pudding). Kidneys were one of the last odd bits to make their way into my diet. As a child I would hear of this traditional British meal and cringe- funny how things can change (and how long it can take to get over childhood aversions!). I realize offal isn’t for everyone, but I hope this might inspire someone to give offal a chance. There are other great things to do with odd bits (imagine a post on offal that doesn’t talk about liver! ), and with the help of the internet you can get all kinds of tips and recipes (or you can buy a book). Even if offal isn’t for you, I hope you can recognize that nose-to-tail eating is a responsible decision when thinking about the ethics of eating meat (even if you do find it a little gross). The hours of my surgery clerkship have my internal clock a little out of whack, but don’t worry, I’m not 7 months out of step. Actually, I’m all-abuzz about the arrival of spring, and all the great things that this season brings! (I’m also all-abuzz because I have a full weekend off for the first time in 3 weeks… Hazzah!). I don’t think there’s a place I’ve been where spring doesn’t bring a certain sense of joy and optimism- there’s something about the change in temperature, the awakening of plants, and the enthusiasm of spring mating games (human and otherwise) that makes this a very special time of year. While I haven’t been able to enjoy as much of the spring weather, spring sun, and spring scenery as I would like (not to mention the spring mating games), I am enjoying taking advantage of one of the benefits of spring- the food! To me, the start of spring is signified by the start of the asparagus season. While I’ve had limited success growing it myself (probably a combined issue of a poor planting location and an inability to let the first couple years of spears grow unmolested (you shouldn’t pick the spears for the first few years so the crowns can grow to be big and strong… I suppose patience (at least for asparagus) is not one of my redeeming characteristics)), there is a farm ½ a mile down the road that produces it by the bucket load. 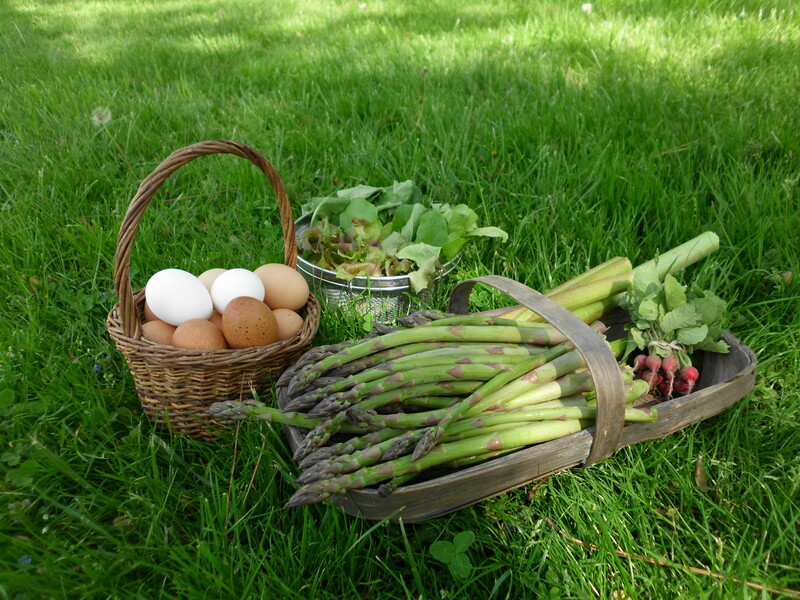 As soon as the roadside stand comes out, you can be guaranteed to find asparagus in my fridge. This asparagus is fresh, with no need to *snap* the bottoms off and with excellent texture and flavor. For a month or so, asparagus is a staple of my diet, and there are days when I’ll have it at every meal of the day (honestly- asparagus, poached eggs, and Hollandaise sauce- it works for breakfast, lunch, or dinner!). Outside of this brief season, I’ll never buy asparagus (you’re just setting yourself up for disappointment), and if I happen to be served asparagus at other times of the year I’m puzzled by the physical resemblance but gustatory dissimilarity between the tender and tasty spring spears I’m accustomed to and the tasteless stringy curiosities I’ve been served mid-winter. My mention of poached eggs, asparagus, and Hollandaise sauce was no accident. Not only is this one of my favorite meals, but it’s also (at least to me) an excellent seasonal meal. While my hens produce eggs year-round, they outdo themselves in the spring. Production is up, and as they feast on new grass and fresh bugs, the quality (and flavor!) of their yolks increases. Similarly, butter from cows grazing on spring grass is brilliantly yellow with a decadent taste. Combined (with a squeeze of a not-so-local lemon) these ingredients come together to form a culinary delight that complements asparagus and poached eggs perfectly (as well as a number of other delicious things). In my book, asparagus is the ultimate ‘spring-tiding’, yet there are other signs of spring (along with the orange yolks of my chickens’ eggs) that I look forward to every year. Spring brings the first fresh greens (arugula being my favorite), and fresh fruit-like-substance to the table. Rhubarb, a stem that is transformed by stewing and sweetening into a dessert, is another tiding of spring. My father reasons (and he might well be right), that the only reason anyone ever ate rhubarb is that it is one of the earliest spring products. If this curious, tart, stem came to maturity during the summer, between waves of berries and stone fruit, it seems unlikely that it would be paid much attention, but as one of the earliest edibles of the year, it finds it’s way to our table. I am not a puritan. I enjoy non-local, non-seasonal fruits and vegetables, and some of my dietary staples are things that never have been and never will be local or seasonal to my environment (Oh, to live in a place where avocados, cacao, coffee or coconuts are local or seasonal!). Yet every winter I await the coming of spring and the bounties that the ensuing seasons will bring. The pungent reminder of asparagus recently consumed harkens the arrival of a bounty of crops that the following months will bring! Earlier this week I received a newsletter from PaleolithicDiet.com that included the challenge to write a blog post about what you would cook if you were selected to receive a copy of Jennifer McLagan’s book Odd Bits: How to Cook the Rest of the Animal. In all fairness, I don’t need a copy of McLagan’s book (I already own one), but I like having a topic that I’m enthusiastic about and that doesn’t require I pull any scholarly papers and reference my sources! I like to write, but I haven’t had time to really research some of the more academic topics I’m interested in recently. I accept Patrik’s challenge, and if he wants to send me another copy, I’ll make sure to share it with someone that will love, appreciate, and use it! Perhaps more important that what I would (or do) cook from Odd Bits, is why I cook offal. To me there are three main reasons (in no specific order). 1: It’s the right thing to do, in respect for the animal you are eating. As I mentioned in my post on the ethics of eating meat, I have raised (and slaughtered) my own chickens for a number of years. When I learned to “process” chickens, I was taught to save the heart and liver, both organs that I knew I should eat, but ones I’d never eaten before. My parents are British, and while it may have deeply pained them, I’d never been one for steak and kidney pie, nor had I been one to eat other ‘odd’ bits of animal. 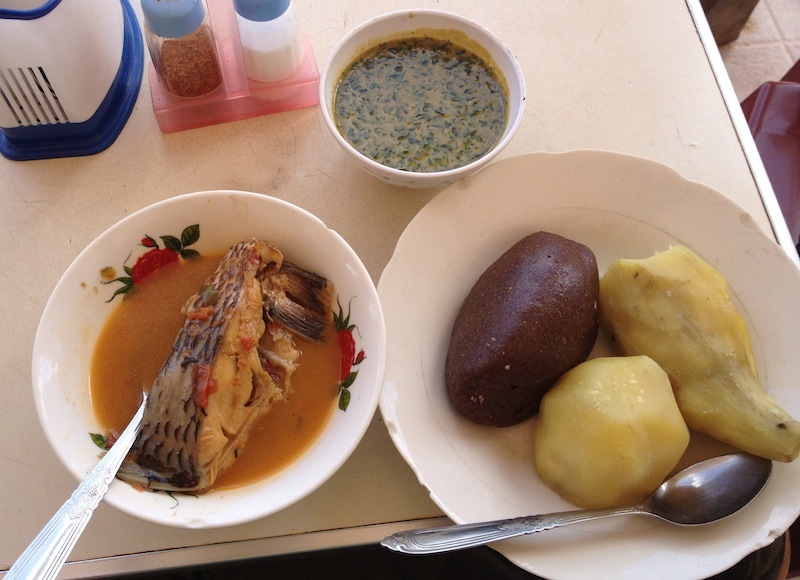 I, like so many, fell victim to the ‘eww’ factor of eating odd bits and stuck to the traditional muscle meats. This changed when I started killing my own chickens. First- I knew how much time and effort went into raising and butchering these animals, and throwing away edible bits just seemed wrong. Second- and more importantly, I was taking an animals life, and while I had done my best to make their life (and death) as pleasant as possible, it only seemed right that when I killed them, I used all the bits I could. Third- at that point I was well on the slippery slope to “evolutionary wellness”, and had been reading up on the nutritional benefits of eating organs. I’ll admit that the first time I cooked chicken livers and hearts I needed a bit of Dutch courage. After imbibing a couple glasses of a delicious Marlborough region Sauvignon Blanc (my weakness when it comes to white wine), I briefly sautéed fresh livers (cut into bite sized pieces) and hearts (halved) in a generous portion of butter and then topped them with salt and fresh pepper. 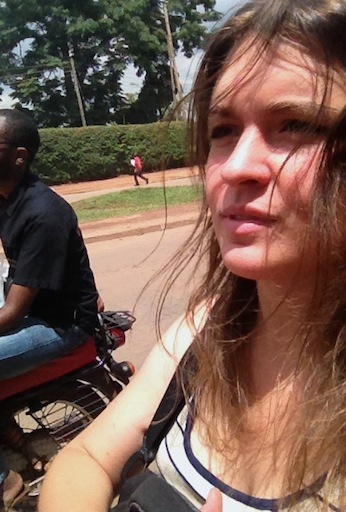 With my Dutch (or perhaps I should say Kiwi?) courage, I took my first bites and was hooked. 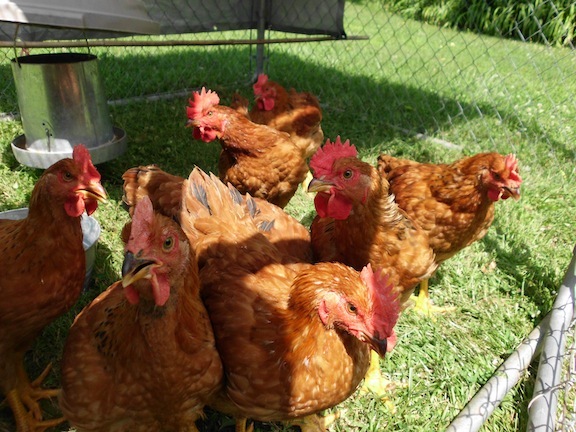 While I rarely eat chicken these days, if I spot hearts and livers from pastured chickens for sale at the farmers market I usually nab a couple pounds. Not only are they delicious, but it seems only right that if we kill an animal, we should make the most of that sacrifice. The same concept applies to the cattle that my family raises. I think the old guy that runs the slaughter house we go to gets a kick out of me and my enthusiasm for odd bits (or at least he’s good natured about humoring me- I can imagine him telling his friends about some ‘young woman with a hankering for weird cow parts’), and it seems like each year my list of ‘bits to save’ gets longer. Along with the cut sheets for our animals I include a cover sheet that includes all the extra bits I want to make sure he saves for us. Usually this butcher will return the heart, liver, tail, and tongue, but I’ve added sweet breads, kidneys, marrow bones, and fat to the list. This generally adds a couple extra boxes to my pickup run, and he had a funny smile last time he handed over a 40+ lb box of suet, but he complies (and I think I might need to start making soap- I probably already have a lifetime supply of tallow!). Much like with the chickens, I feel it is important to get the most out of the animals that my family has cared for that have died to feed us. 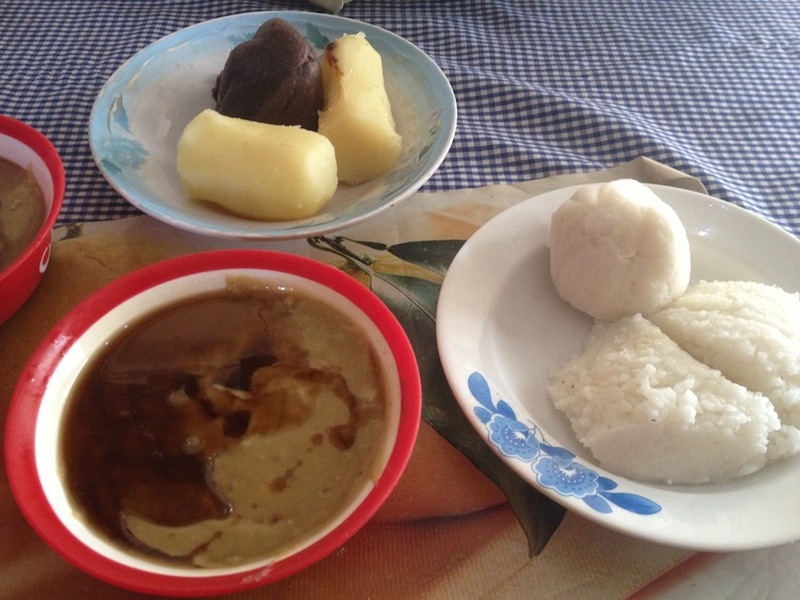 2: Offal is darn nutritious! Not only do I think it is morally appropriate to eat ‘nose to tail’, it’s also an excellent nutritional choice. Organ meats are rich in compounds that are lacking (or low) in other parts of the animal. Liver, for example, is very rich in vitamin A (although you should never eat Polar Bear liver- it is so rich in Vitamin A it is toxic! 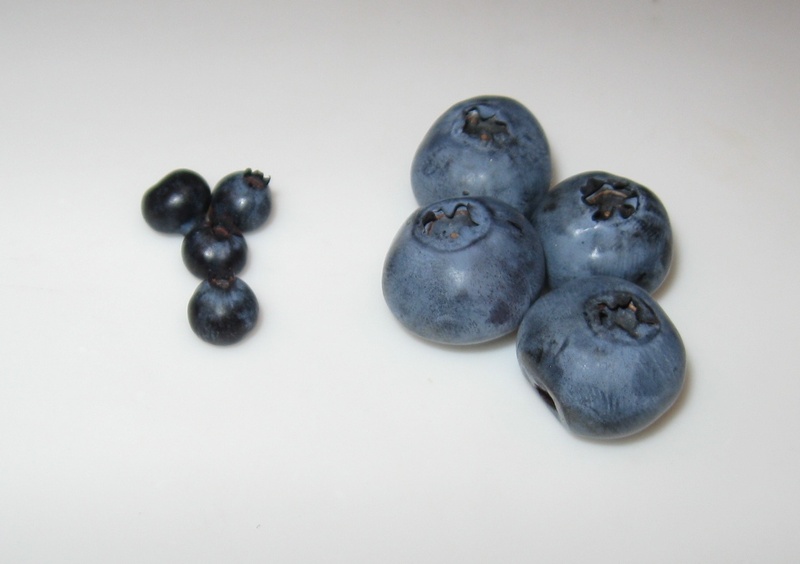 ), many of the B vitamins, and iron (to only list a few). 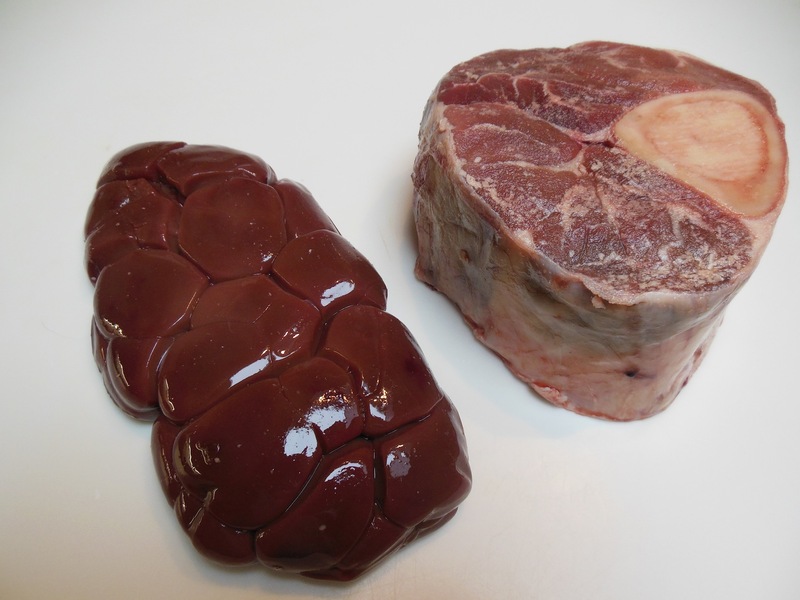 Heart, kidney, marrow, and sweet breads all offer different nutritional profiles. I’m generally not joking (nor am I alone) when I refer to liver as “Nature’s multivitamin”. 3- Odd bits are tasty! Once you get over the ‘weird’ factor of eating different bits of animals, you’ll start to realize they’re really not so odd and that they can be VERY tasty. Tongue tacos, grilled heart, sautéed liver (+/- bacon), steak and kidney… these are all very cookable dishes that can be very delicious. Just like anything else in the kitchen, you can mess them up, but cooked right, these dishes are a delicacy! There’s a reason that some of the fanciest restaurants serve offal, and it’s not just the ‘wow’ factor of serving something unique- offal is delicious! It’s only in our modern society that ‘nose to tail’ eating is not the norm. I’d wager that for most of our evolutionary past, humans have taken advantage of all the edible bits an animal had to offer. While many still find ‘odd bits’ off-putting, the interest in them is growing. That’s not only obvious by the publication of books such as Odd Bits, but also by observing changes in the people around me. 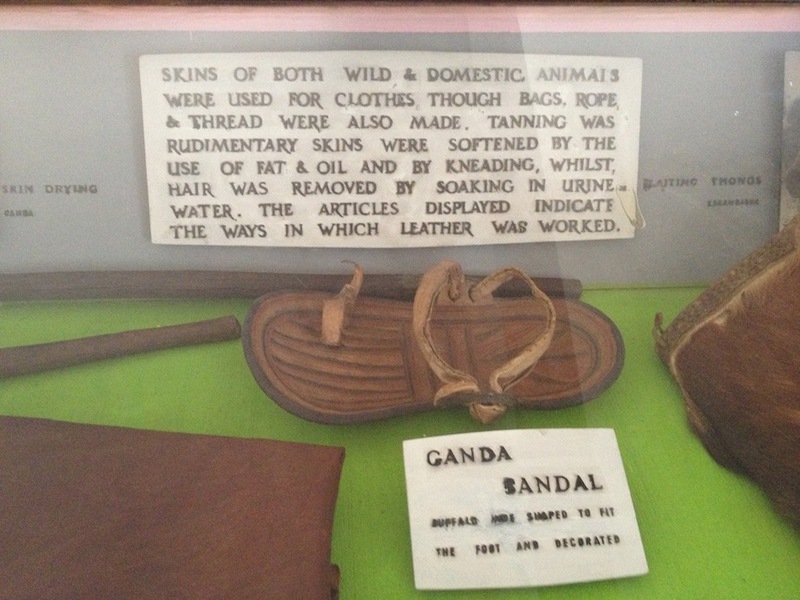 When my family sold our first beef cattle, few (if any) customers wanted ‘odd bits’. As I find customers that are interested in evolutionary eating, my stash of unclaimed offal diminishes (I think I miss the extra tongues the most!). I’m happy, however, if others start to embrace offal, in it’s many forms. Eating offal is delicious, nutritious, and shows respect to the animal you’re eating. If you’re intimidated by the idea of cooking offal at home, order out (Korean BBQ is a great way to have tongue (and if you’re brave, intestines-yum!)) or you can go the route I travelled and obtain a bit of liquid courage*! *attempt at your own risk!